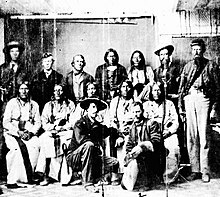 The Sand Creek massacre (also known as the Chivington massacre, the battle of Sand Creek or the massacre of Cheyenne Indians) was a massacre of Cheyenne and Arapaho people by the U.S. Army in the American Indian Wars that occurred on November 29, 1864, when a 675-man force of Colorado U.S. Volunteer Cavalry  under the command of U.S. Army Colonel John Chivington attacked and destroyed a village of Cheyenne and Arapaho people in southeastern Colorado Territory,  killing and mutilating an estimated 70–500 Native Americans, about two-thirds of whom were women and children. The location has been designated the Sand Creek Massacre National Historic Site and is administered by the National Park Service. 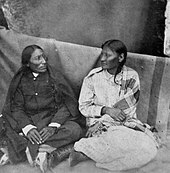 Black Kettle, leading chief of around 163 mostly Southern Cheyenne, had led his band, joined by some Arapahos under Chief Niwot, to Fort Lyon in compliance with provisions of a peace parley held in Denver in September 1864. After a while, the Native Americans were asked to relocate to Big Sandy Creek, less than 40 miles northwest of Fort Lyon, under the threat of their safety. The Dog Soldiers, who had been responsible for many of the attacks and raids on whites, were not part of this encampment. 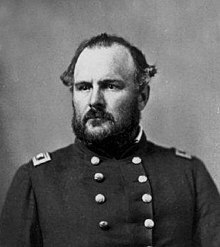 Although initial reports indicated 10 soldiers killed and 38 wounded, the final tally was 4 killed and 21 wounded in the 1st Colorado Cavalry and 20 killed or mortally wounded and 31 other wounded in the 3rd Colorado Cavalry; adding up to 24 killed and 52 wounded. Dee Brown wrote that some of Chivington's men were drunk and that many of the soldiers' casualties were due to friendly fire  but neither of these claims is supported by Gregory F. Michno  or Stan Hoig  in their books devoted to the massacre. 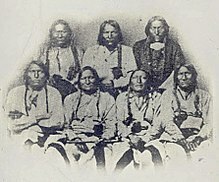 The massacre disrupted the traditional Cheyenne power structure, because of the deaths of eight members of the Council of Forty-Four. White Antelope, One Eye, Yellow Wolf, Big Man, Bear Man, War Bonnet, Spotted Crow, and Bear Robe were all killed, as were the headmen of some of the Cheyenne military societies. Among the chiefs killed were most of those who had advocated peace with white settlers and the U.S. government. The net effect of the murders and ensuing weakening of the peace faction exacerbated the developing social and political rift. Traditional council chiefs, mature men who sought consensus and looked to the future of their people, and their followers, were opposed by the younger and more militaristic Dog Soldiers. After the actual details of the massacre became widely known, the United States federal government sent a blue ribbon commission whose members were respected by the Indians, and the Treaty of the Little Arkansas  was signed in 1865. It promised the Indians free access to the lands south of the Arkansas River, excluded them from the Arkansas River north to the Platte River, and promised land and cash reparations to the surviving descendants of Sand Creek victims. The Sand Creek Massacre Trail in Wyoming follows the paths of the Northern Arapaho and Cheyenne in the years after the massacre. It traces them to their supposed wintering on the Wind River Indian Reservation near Riverton in central Wyoming, where the Arapaho remain today. The trail passes through Cheyenne, Laramie, Casper, and Riverton en route to Ethete in Fremont County on the reservation. In recent years, Arapaho youth have taken to running the length of the trail as endurance tests. Alexa Roberts, superintendent of the Sand Creek Massacre National Historic Site, has said that the trail represents a living portion of the history of the two tribes. The event has also been written about in such works of literature as “ Cheyenne Autumn” (1953) by Mari Sandoz;The Massacre at Sand Creek (1995) by Bruce Cutler; A Very Small Remnant (1963) by Michael Straight;" Young Sherlock Holmes: Fire Storm" by Andrew Lane, 2011 Centennial (1974) by James Michener; From Sand Creek (1981) by Simon Ortiz; Bury My Heart at Wounded Knee (1971) by Dee Brown and Choke Creek (2009) by Lauren Small. Flight (2007) by Sherman Alexie depicts a fictionalized version of the event. Songs about Sand Creek include Gila's "Black Kettle's Ballad", Five Iron Frenzy's "Banner Year", and Fabrizio De André's " Fiume Sand Creek". ^ " Jim Beckwourth". National Park Service. ^ a b Laura King Van Dusen, Historic Tales from Park County: Parked in the Past ( Charleston, South Carolina: The History Press, 2013), ISBN 978-1-62619-161-7, p. 33. ^ Hernandez, Elizabeth (December 3, 2014). "Gov. Hickenlooper apologizes to descendants of Sand Creek Massacre". The Denver Post. Retrieved December 16, 2014.